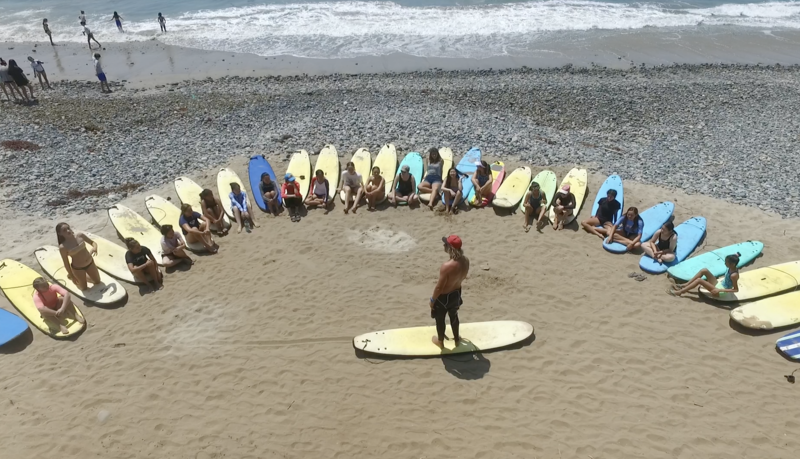 The Endless Summer Surf Camp offers private, semiprivate and group lessons year round. Surf Lessons consist of an on the sand surf and safety demonstration. Then we will enter the water and make our surfing goals come true. Our Instructors are all certified and have years of experience. All surf lessons are 2 hours in length and take place at one of our San Onofre Locations. We will meet you at the beach and provide all your equipment needed as well as certified surf instructors. In the summer months we use San Onofre Bluffs Surfing Beach and during the months of October – May we instruct at San Onofre Surf Beach. Have a group who wants lessons? No matter how big or small we can handle it. We accommodate groups up to 50 students at a time. Corporate Groups, High School group, College Group, Boy or Girl Scout Troops, Church Groups? We have got you covered. We can organize something to meet your needs whether it just be surf equipment and instructors for your group or more. We have hosted Corporate Groups such as Nike, High Schools and Universities, as swell as birthday and bachelor parties. We are the only Licensed and Certified Surf School in the San Onofre State Park. We can handle lessons at our Location or travel to yours (limited travel area and add in Travel cost). We also have the facilities to run mini group camps including food and accommodations during certain parts of the season. Sage Hill High School, Bishop High School, Concordia University, Pitzer College, University of Arizona, Nike Corporate Groups, etc. Surf Equipment (board and wetsuit) and professional instruction provided. Call (949) 498-7862 or e-mail to book a lesson or to inquire about group lesson rates.